Chocolate Shortbread Cookies don’t last long on a cookie tray. 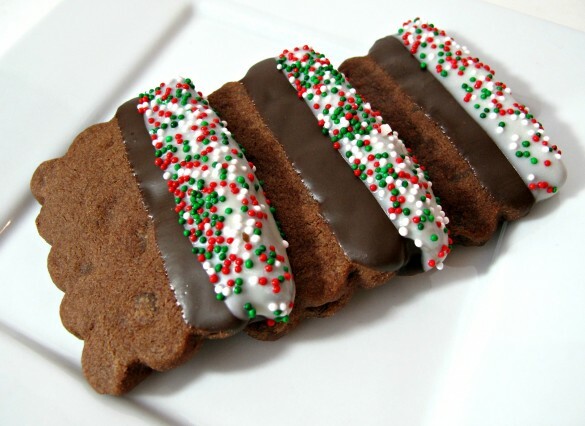 With chocolate stripes and sprinkles, this shortbread is alluring! 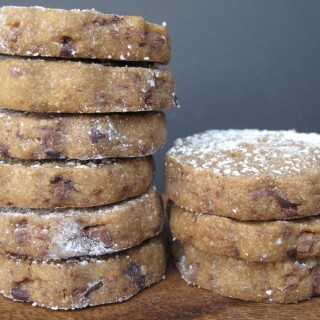 The ultra chocolaty flavor makes these melt in your mouth cookies an instant favorite. They are a great cookie to make ahead, give as gifts, or mail in a care package! Updated from the original December 2014 version. Last updated November 2018. This post originally appeared on The Monday Box for the 2014 Great Food Blogger Cookie Swap and has been one of my favorite cookies for holiday cookie swaps ever since! 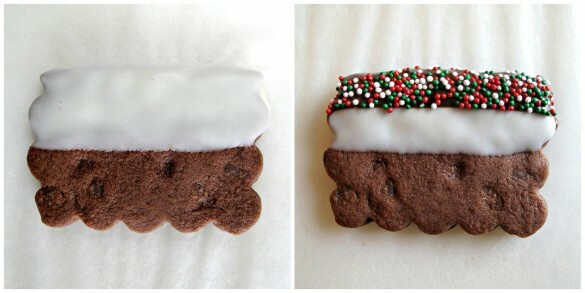 I was one of 600 bloggers who contributed 600 cookie recipes, just in time for holiday baking! Each blogger participating in the swap sent out three dozen cookies, a box of twelve cookies each to three assigned food bloggers. In return, each blogger received three dozen cookies (a box of twelve cookies from three different food bloggers). That made 21,600 cookies exchanged between bloggers! Best of all, thousands of dollars, from entry fees and sponsor donations, were raised for Cookies for Kids’ Cancer! I was delighted with the three packages of cookie deliciousness that arrived at my door. I hope my recipients enjoyed The Monday Box contribution to the swap; rich, chocolaty Chocolate Shortbread Cookies. These are the Christmas cookies I received in the mail! I received cookies from three talented baker-bloggers. Allison from Celebrating Sweets sent a box full of chewy Ginger Molasses Cookie Bars, drizzled in icing. Julia from Sprinkled with Jules sent irresistible Brown Butter Toffee Chocolate Chip Cookies perfectly sized for their shipping tube. Renata from First Time Foods boxed up Toffee Pecan Shortbread dipped in chocolate. All three cookies are as delicious as they look! Click through to check out the recipes for these delights. Thanks, Allison, Julia, and Renata! 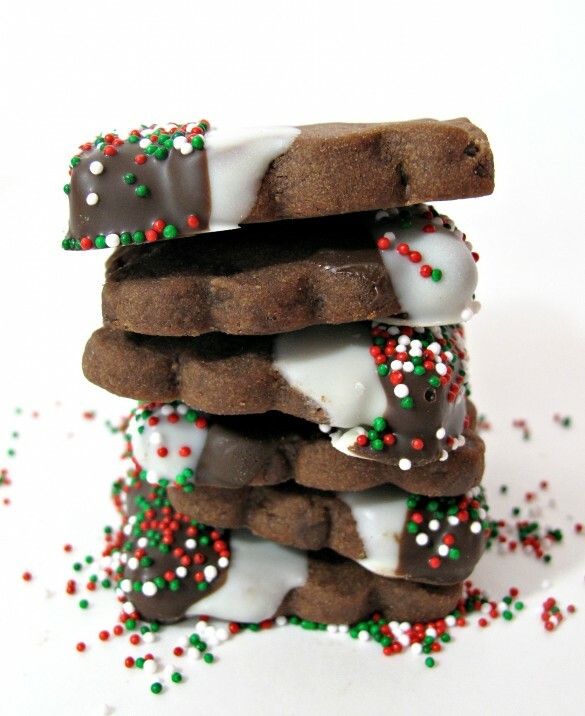 Chocolate Shortbread Cookies dressed up for holiday gifts and care packages! I chose to send Chocolate Shortbread Cookies in my swap packages. Shortbread flavor has the magical characteristic of improving over time, making it a great shipping cookie. This version uses confectioners’ sugar for melt-in-your-mouth texture. The rich chocolate flavor comes from both cocoa powder and semi-sweet chocolate chips. Chocolate cookies are always the first to disappear from cookie trays! This is a wonderful dough to work with and can be shaped in a variety of ways. The easiest way would be to form the dough into logs, chill until firm, then slice into ¼”– ½” discs and bake. Another way would be to roll out the dough, then after chilling, use a knife to slice into bars, then bake. For my Chocolate Shortbread Cookies, I envisioned a scalloped edge, so I rolled out the dough and used a cookie cutter. Though I chose the most time intensive method (typical behavior), it was still a quick and easy process. Dip first in white chocolate, then in dark chocolate for eye catching chocolate cookies! Both white and dark chocolate (Chocoley.com Dipping and Coating formula) were used for dipping. To create the stripes of chocolate and sprinkles, I dipped each cookie twice. First, I dipped each cookie half way in one flavor of chocolate. The chocolate was allowed to set in the refrigerator for about 5 minutes. Then just the edge of the cookie was dipped in the second flavor of chocolate and sprinkles were added immediately. The double dipping produced dressed up cookies with doubly chocolate goodness. 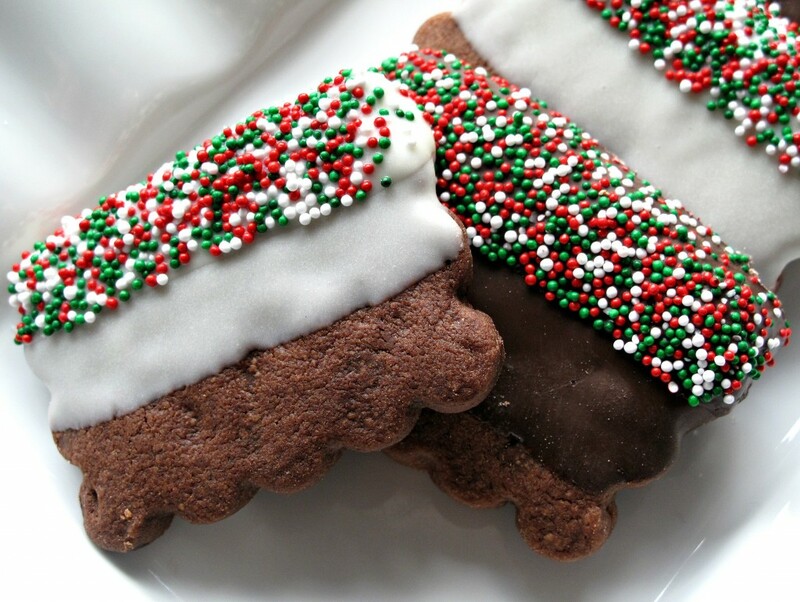 This shortbread cookies recipe is sure to become a holiday favorite! The hundreds of Great Food Blog Cookie Swap 2014 recipes are still available in two round up posts which include thumbnail photos from all 600 recipes at Love and Olive Oil and at The Little Kitchen. Enjoy! Your search for the best shortbread cookies recipe is over! Give these a try! Wishing you all joyful, peace filled holidays, with lots of cookies! 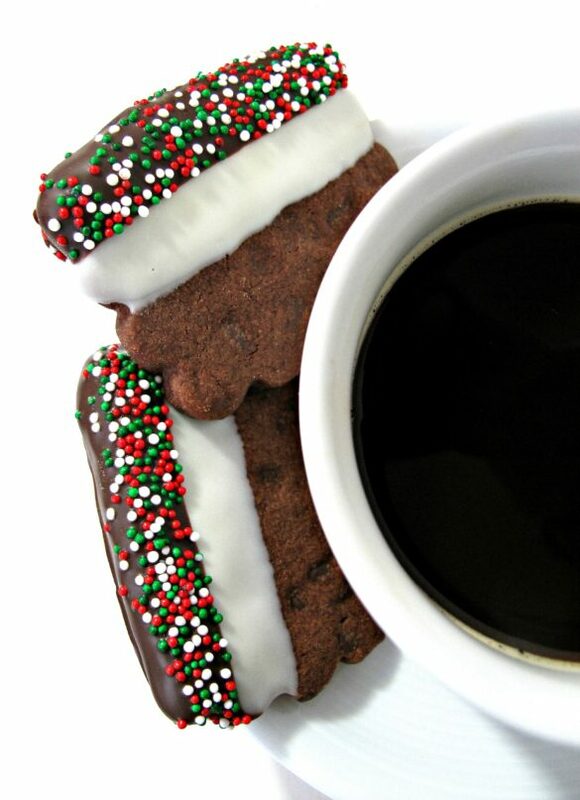 You will want to have plenty of these cookies for all of your holiday snacking and gifting needs! The shortbread stays delicious for up to two weeks, or you can freeze the cookies before baking and bake them as needed. In a medium bowl, whisk together flour, cocoa, chocolate chips, and salt. In the bowl of an electric mixer, cream butter and sugar until light. Add vanilla and mix to combine. Gradually add flour mixture and mix just until all of the flour is incorporated and the dough forms. Form the dough into a disc, wrap in plastic, and chill for at least 1 hour or overnight. When ready to bake: Preheat oven to 325˚F. Line baking sheet with parchment paper. Between two sheets of parchment paper, roll out dough to ¼”- ½” thickness. Slice into shapes or use a cookie cutter. Place on prepared baking sheet about 1” apart and bake for 10-12 minutes. (Cookies firm as they cool). Allow cookies to cool on the baking sheet for 5 minutes before transferring them to a wire rack to cool completely. Dipping and decorating:Use wax paper to line two cookie sheets or other flat baking pans that will fit into your refrigerator. Place one of the melting chocolates in a bowls large enough that the chocolate fills it up to about 1 inch below the rim. Melt the chocolate wafers in the microwave at 50% power for one minute. Stir. If not completely melted, return to the microwave and heat for 15 second intervals, stirring between intervals, until melted. Dip the cookies into the chocolate, gently tap the wrist of the hand holding the dipped cookie to allow excess chocolate to drip back into the bowl, then set the dipped cookie onto the prepare cookie sheet. After completing 6 cookies, place the tray into the refrigerator to set for about 5 minutes. When all of the cookies have been dipped and set, melt the second flavor of chocolate in a separate bowl. Dip the edge of a cookie into the melted chocolate just long enough to coat. Tap off excess and place on lined baking sheet. Add sprinkles immediately, before chocolate can begin to set. After 6 cookies have been dipped and sprinkled, place in the refrigerator again to set the chocolate for 5 minutes. Store layers of cookies between wax paper in an airtight container at room temperature for up to 2 weeks. Double wrap small piles of cookies in plastic wrap, then place snugly in an airtight container or zip lock bag for mailing. Nonpareil sprinkles in Christmas colors add eye appeal and holiday flare to all of your baking! If you plan to do a quantity of baking this season, I recommend buying this 15 ounce bag of nonpareils. The price is much better than buying multiple small jars. Wendy, these are so pretty! I love how simply you styled and photographed them. I participated in the Great Blogger Cookie Challenge 2 years ago. It was so exciting to get cookies in the mail! I just didn’t have time this year, but hope to get back to it again next year. Thanks, Cindy! Among other blog related goals, improving quality of photography is at the top of my list. I finally purchased a new camara. Now comes the steep learning curve of figuring out how to use it! 🙂 I am trying for simple styling that focuses on the cookies. A work in progress. Getting surprise packages in the mail is what makes the Cookie Swap fun for me, too! Wishing you and your family a peace filled Chanukah and a healthy, happy New Year! Thank you, Laura! One can never have enough cookies. 🙂 (unless one is trying to fit into one’s skinny jeans….but lets not think about that!) However, sharing is the perfect solution! Eat one or two and share the rest. 🙂 Happy baking and joyous holidays! 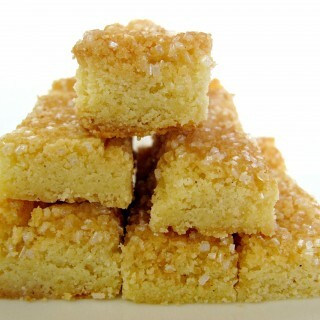 Shortbread is such a delicious classic and it’s so nice that it keeps well and ships well! I don’t know what it is but I have a thing for nonpareil sprinkles – you did a beautiful job dipping and decorating your cookies, Wendy. What a lovely swap! I totally agree about nonpareil sprinkles! I love them in all their amazing color combinations. 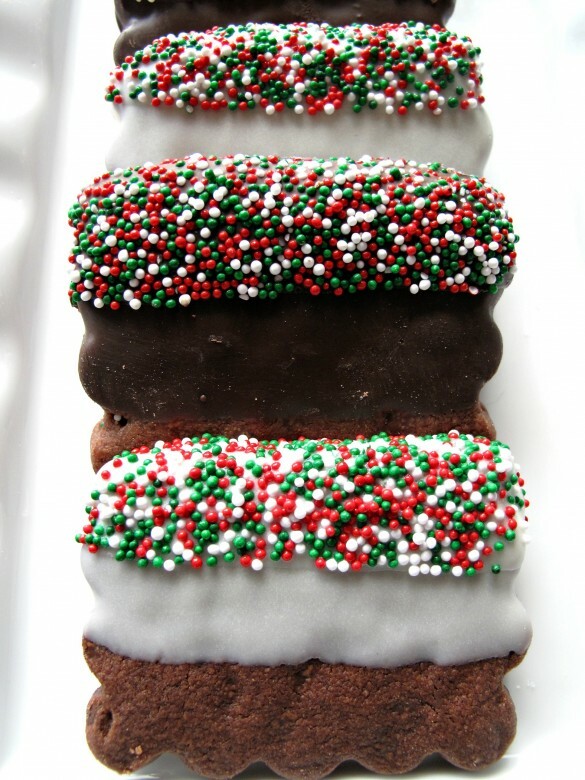 Things decorated with nonpareils look tastier to me….certainly blingier (new invented word). 🙂 I only fell in love with shortbread in the last year or so. Now I am making up for lost time and cookie opportunities! The swap always is fun. These cookies look lovely, Wendy! I wish I had been lucky enough to receive them in the mail. Guess I’ll just have to try them out myself! 🙂 The shortbread recipe is a bit different than the one I used, so I’ll compare the 2 outcomes and see which one I like better. Thanks for the recipe! Beautiful photos. Almost makes me want to bake.lol Definitely makes me want to eat. Yum! I could use a couple of those with my coffee right now! What beautiful cookies. These would make a beautiful gift! I love shortbread too! Thanks, Angela! I sent these out as gifts 🙂 They travel well and taste wonderful! These look gorgeous, I am sure they taste just a wonderful. I love shortbread cookies!. Thank you, Pamela! I love playing with chocolate and sprinkles. 🙂 These cookies are dressed for partying! LOVE these! They look delicious and they’re gorgeous on the plate, too! Dini, this is an easy dough to make and work with. You are a talented cook and I am positive you would have great results! How about a joint platter? My shortbread and your intense dark chocolate rum balls (truffles) ! These look so yummy and I appreciate the packing tips! Yum! 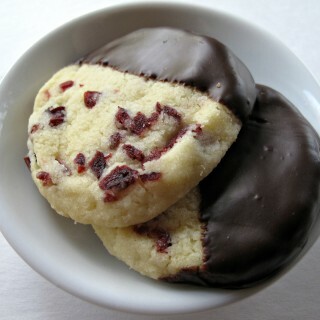 I don’t see chocolate shortbread too often, and they’re one of my favorite cookies! I love that it is Chocolate! Thanks, Cassie! The melt-in-your-mouth texture of shortbread with the flavor of chocolate (and these are VERY chocolate) is a wonderful match! Would these work in a cookie press? I don’t think so, Bryn. I think you need a softer more fluid dough to be able to push it out of the press. Most Spritz cookie recipes seem to include eggs. Plus, the chocolate chips in this recipe would get caught in the holes of the discs. I have a Chocolate Espresso Spritz Cookies recipe that is perfect for a cookie press! Take a look here. Happy baking! Thanks, Mila! I am in love with this chocolate shortbread recipe. The cookies just melt in your mouth! These are such pretty shortbread cookies!! I love the way you dipped them! I’ve actually never tried making chocolate shortbread at home – I need to get on it! Sounds wonderful! Thanks, Ashley! This chocolate shortbread is especially good. I tried 4 versions and liked this one best. The confectioners sugar makes the difference. I hope you have a wonderful Christmas! These cookies look so pretty, I love how they look. These are soooooo cute and pretty!! I’d love to receive these cookies 🙂 Although they’d be dangerous – as I wouldn’t be able to stop eating them. Thanks, Winnie! The chocolate cookie + chocolate chips + double chocolate coating makes these cuties dangerous to any chocolate lover! 🙂 You are so right. I couldn’t stop eating them! These cookies look lovely and yummy! Thank you, Monroe! And thank you for hosting Christmas in July! Not only does this recipe sound delicious but they are so festive and pretty. Thanks for sharing at the Snickerdoodle Create Bake Make Party. These look so festive! They will be one of my features this Saturday at the Snickerdoodle Link Party! What a pretty way to fancy up a shortbread cookie! Thanks for sharing on the Friday Frenzy and congratulations on being featured this week!